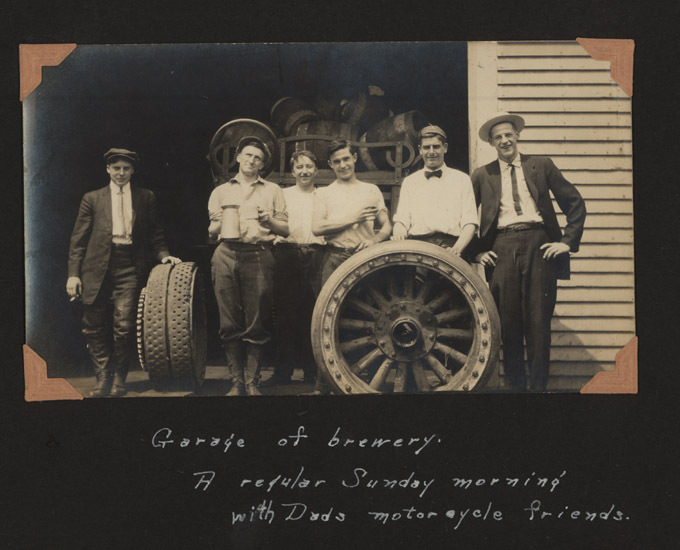 The Flying Merkel and the Miami Cycle Manufacturing & Co. Middletown Ohio. Flying Merkel motorcycles from ca.1912 until ca.1916. 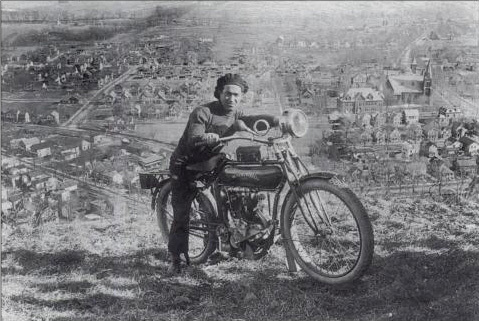 After the Miami Cycle Manufacturing Co. purchased Merkel, the entire range of motorcycles was redesigned. For the year of 1913, the inlet valves were cam driven. 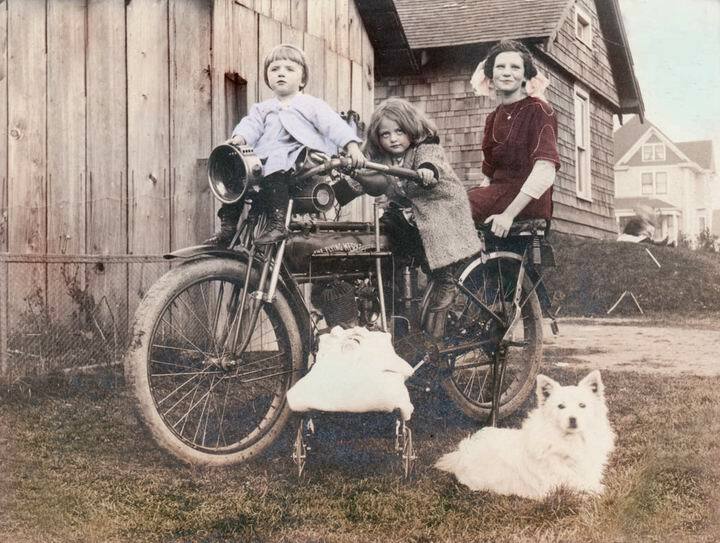 A two-speed hub was available in the top model and the rear suspension had been modified. 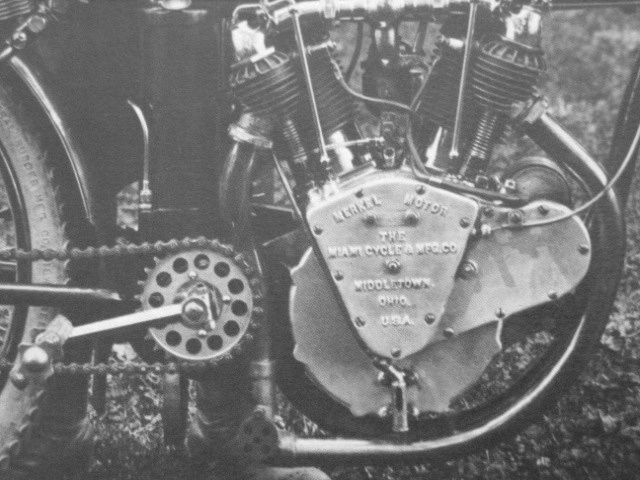 A two directional spring in a single tube with damping from friction elements around the main stay axle improved the riders comfort: "All roads are even for The Flying Merkel"
Other slogans to attract buyers were: "The Most Powerful Motorcycle in the World" and "If it passes you, it's a Flying Merkel". For the year of 1914, a self-starter mechanism was introduced, that turned out to be rather unreliable. The high purchase price of a Merkel slowed down sales, as mass produced cars became cheaper every year. 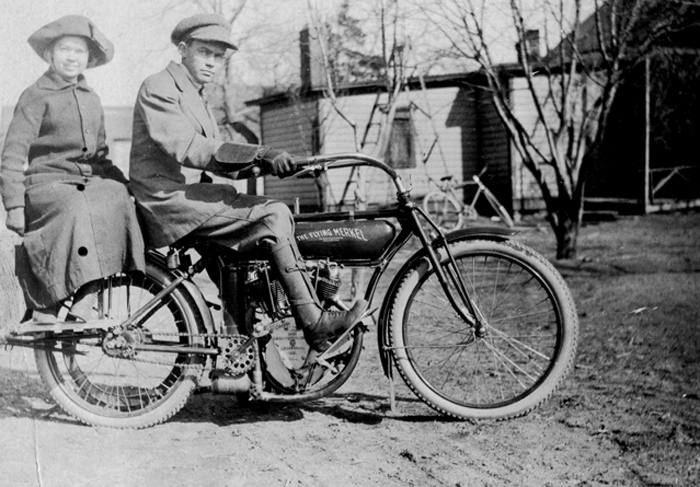 A 1914 Flying Merkel V-Twin was listed in the catalog for $305 against Ford's Model-T with a price tag of $650. Within 3 years the Ford's price dropped to only $345 against the Merkel's $260. 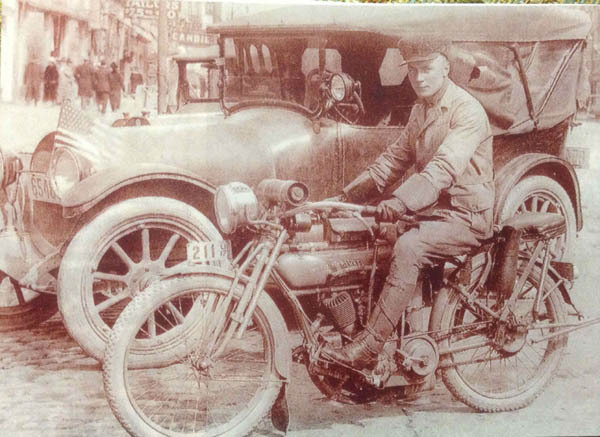 The dapper fellow on the Flying Merkel is Frederick Carl Rossow. He was born in October of 1897 and was married May 1, 1920. Todd Johnson, his maternal Grandson, believes that this photo was taken before he was married, so that would make him between 18 and 22 years old when the photo was taken. According to the 1920 census, he lived in Milwaukee, Wisconsin, with his parents. That is probably where this picture was taken, or in the immediate neighborhood. 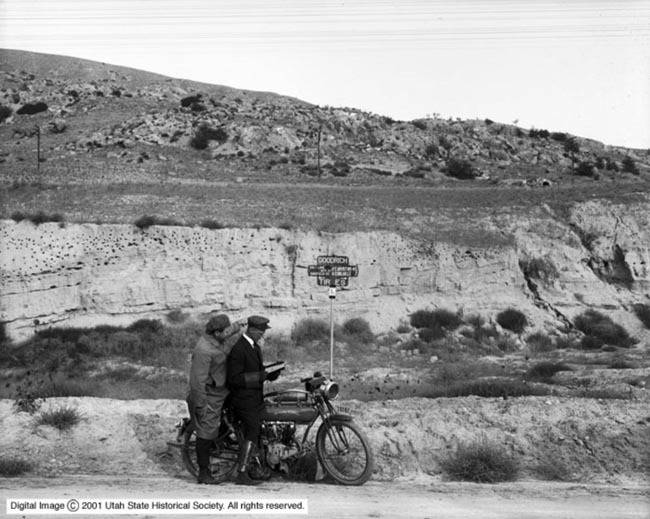 As this is the first and only picture that Todd has found of him on a motorcycle, he is not sure whether it was his or one of his buddies from the day. The Flying Merkel in the picture is a model from the 1913 til 1916 eara. Courtesy of Todd M. Johnson, Germantown, Wisconsin. owner of this photograph. 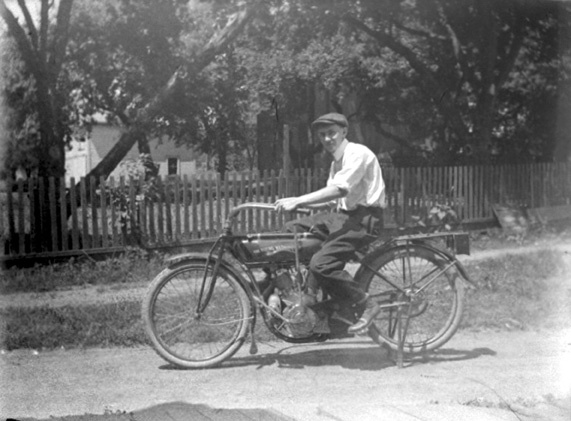 Scene of a gentleman posing with a ca 1913 Flying Merkel motorcycle. 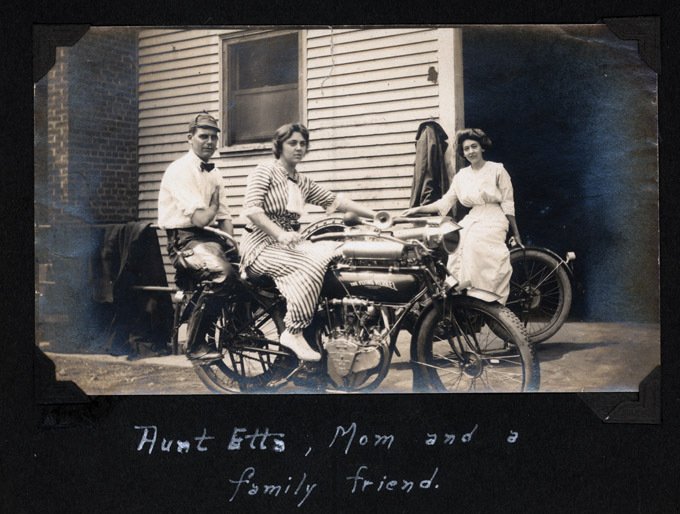 Scan of an original post card from the family photo album. By courtesy of Donald Smith, born in Merkel, TX, now living in Lakewood , WA. 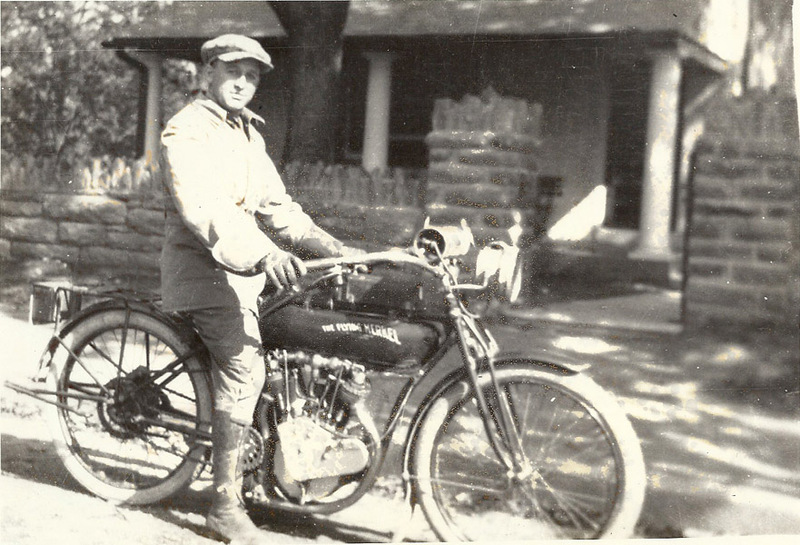 Holmes Kizer, Great-Great uncle of Keith Kizer, sitting on his 1913 Flying Merkel. 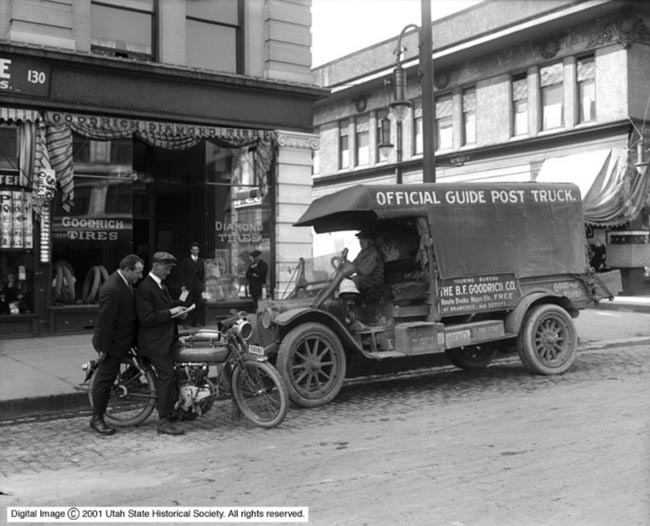 Photo most probably taken in the streets of down town Salt Lake City in 1917. 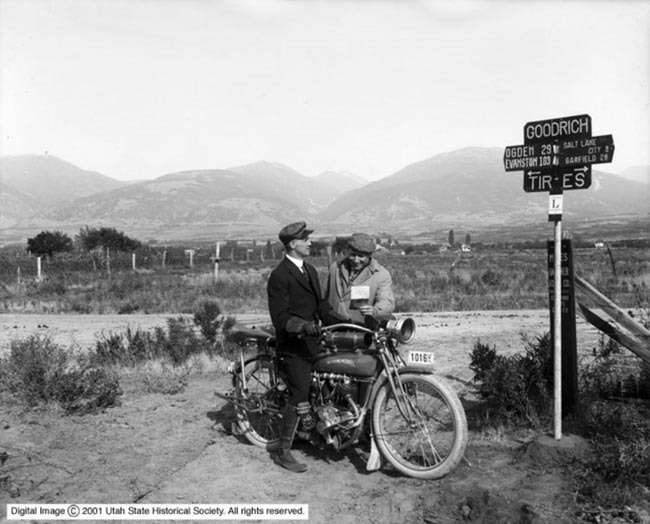 Holmes parents moved to Salt Lake City in the late 1800 s. Photo courtesy of Keith Kizer. 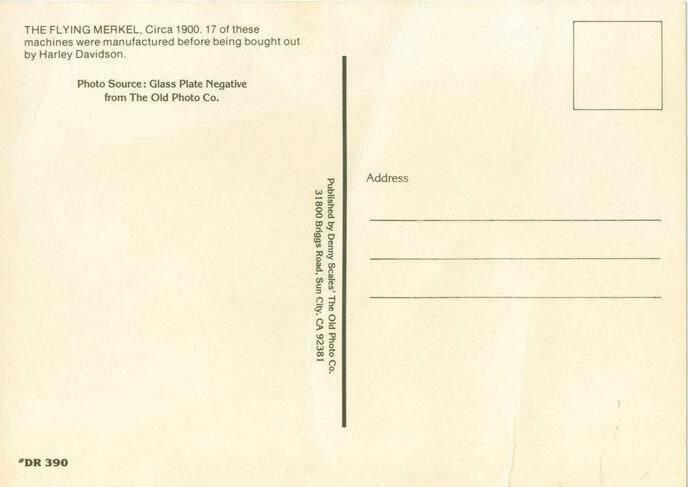 Back of the post card. Note the inaccurate description on the card. 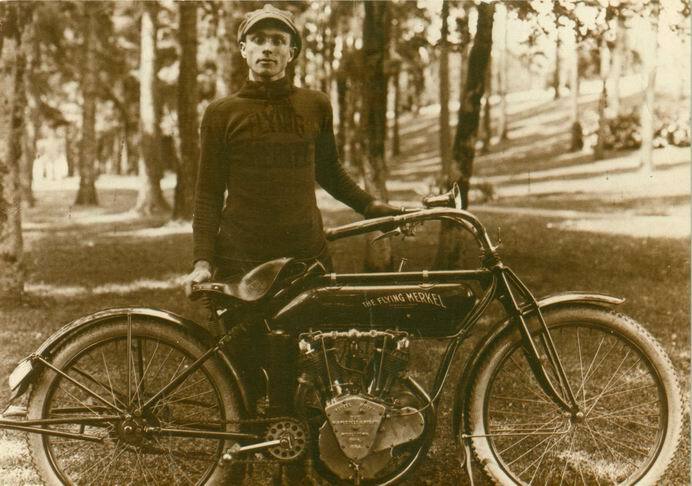 Leroy Voorhees on a ca. 1913, 7 h.p. 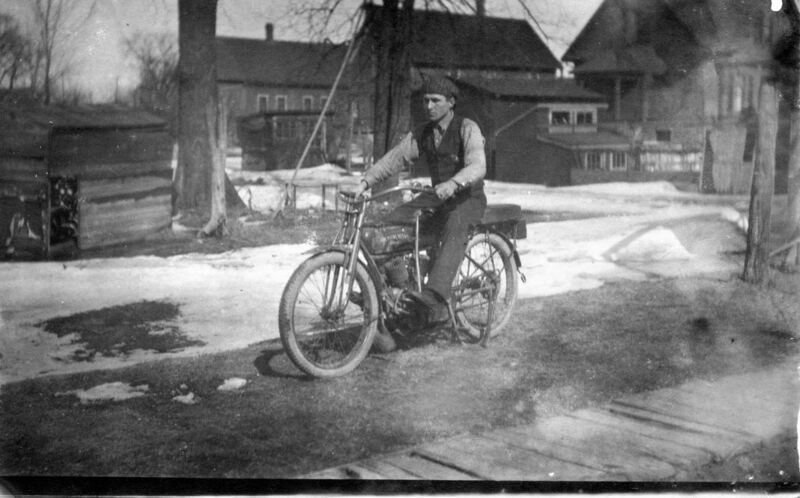 Flying Merkel, in front of his future wife’s house in Melrose Park area of Philadelphia, PA sometime before WWI. 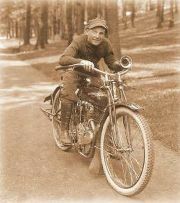 “In his younger days he apparently was a speed freak” says grandson Stephen Voorhees. “I have pictures of him on an Emblem, a Yale, and a Henderson in addition to this Merkel”. Leroy Voorhees was born in 1887 and died in 1973. By courtesy of Stephen Voorhees, Schnecksville, PA, owner of this photo. 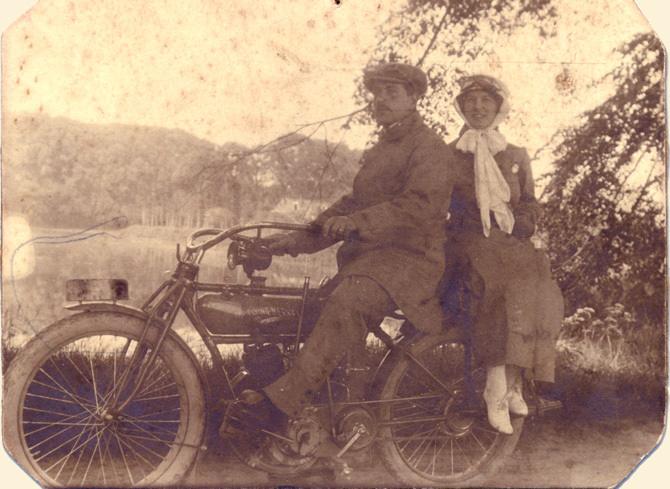 Perry Powell and his sister Bessie on a 1914(?) Belt drive Flying Merkel.. 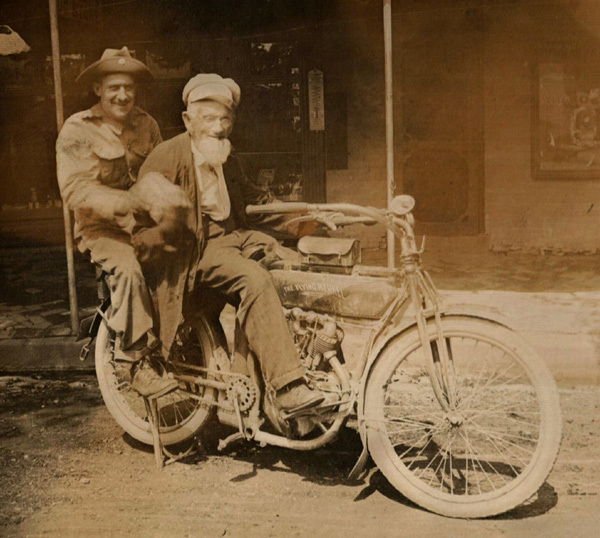 The Powell Brothers ran a motorcycle shop in Grand Island Nebraska. The photo was taken in 1914 or 1915. By courtesy of Bob Powell, Oregon City, OR. With courtesy of Jeff Reppert from Thurmont, Maryland owner of this picture. 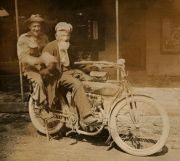 This picture shows his great great grandfather; probably the picture was taken in Lebanon County Pennsylvania. Date unknown.